Numerous techniques and materials for making obturators have been suggested. ,,,,,,,,,,,,, This clinical technique describes oral rehabilitation of a patient with sub-total maxillectomy with a maxillary obturator. 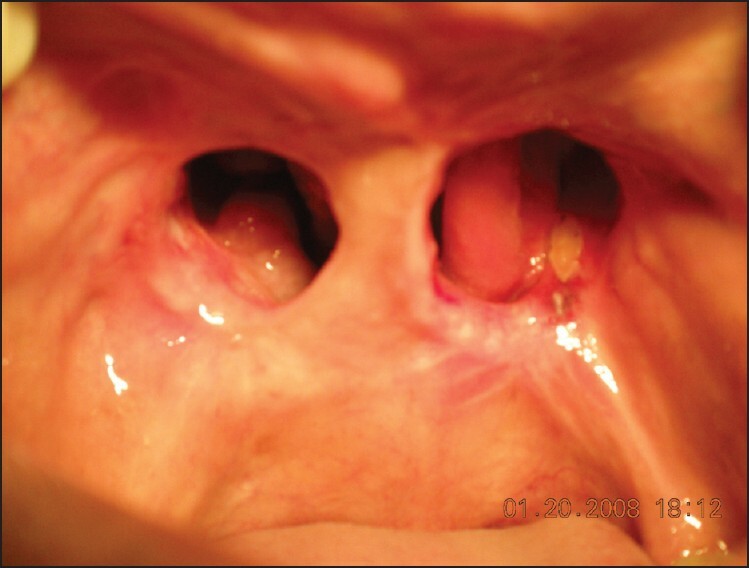 A 55-year-old female diagnosed with SCC of the right maxillary sinus had undergone hemimaxillectomy. She had a recurrence on the left side and was reoperated. 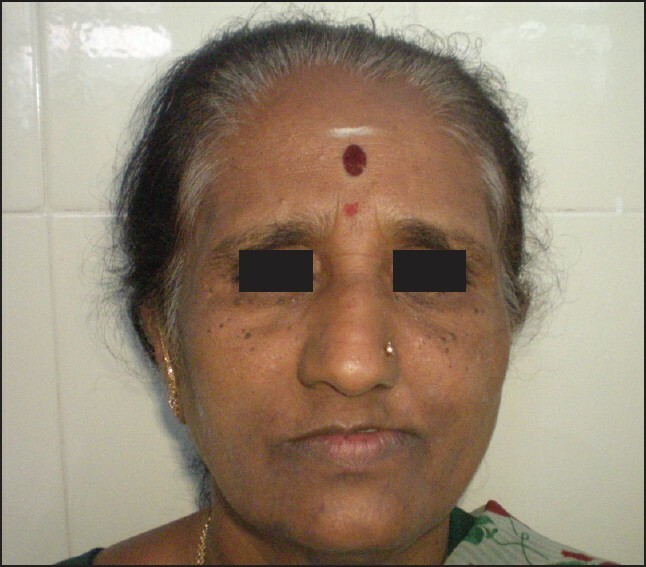 Sub-total maxillectomy was performed and after proper healing, she was referred to the Department of Prosthodontics, Government Dental College, Bangalore, India. 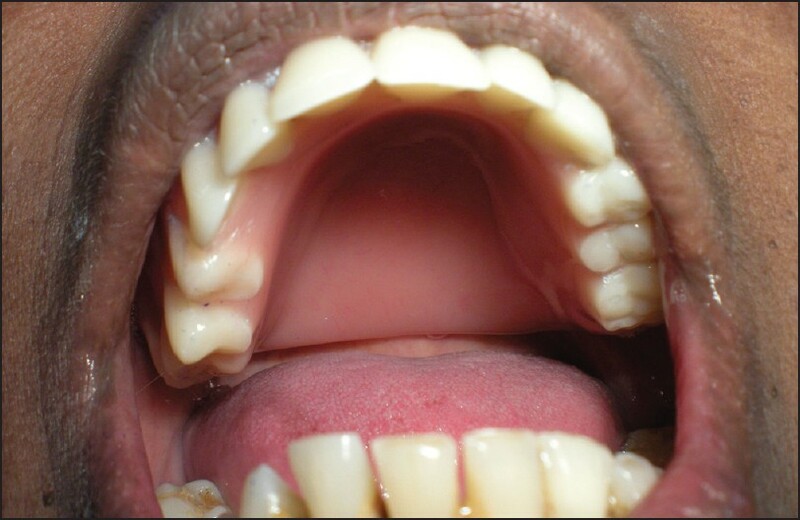 The patient's chief concerns were relative to speech, mastication, and esthetics. Extra-oral examination revealed reduced fullness due to loss of support [Figure 1]. 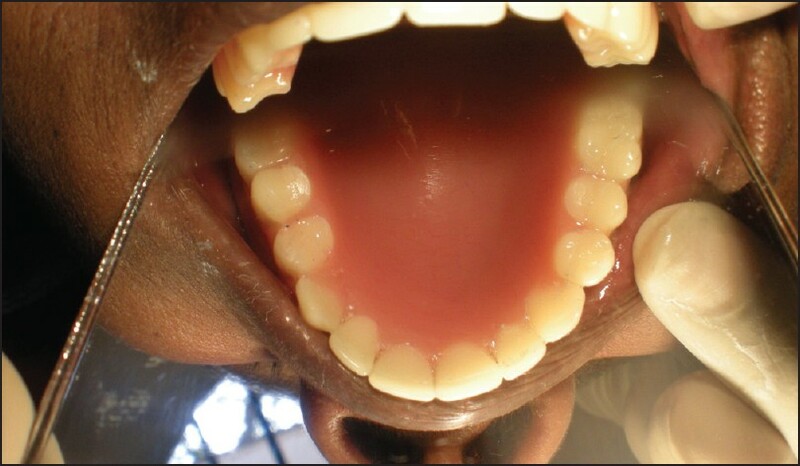 On intraoral examination, a big communication was present between nasal and oral cavity except a minor part of the palatine process of maxilla and horizontal plate of palatine bone [Figure 2]. Speech pathology, head and neck, and maxillofacial prosthetics/dental oncology services were consulted to evaluate the extent of resection and functional deficits. A consensus among the specialists recommended an obturator to restore speech and swallowing abilities and esthetics. 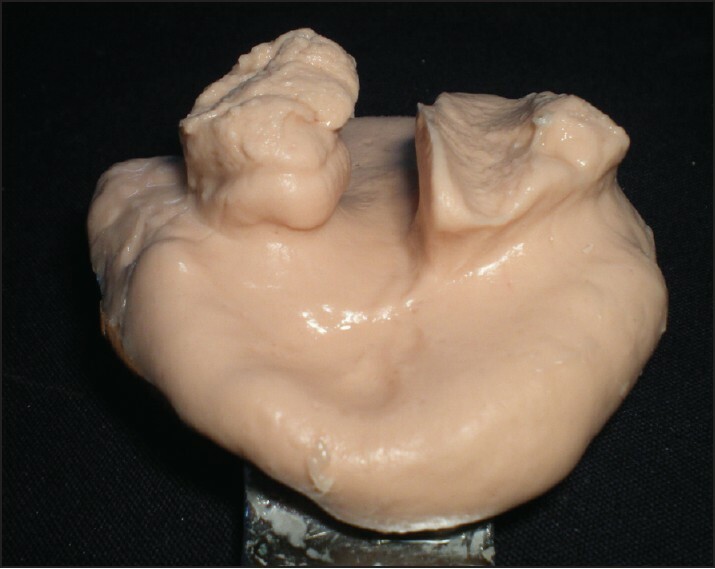 An irreversible hydrocolloid impression was made with a stock tray [Figure 3]. The impression was boxed and poured in type IV stone (Ultrarock, Kalabhai Karson Pvt. Ltd, Mumbai) [Figure 4]. Undercuts on the cast were blocked. 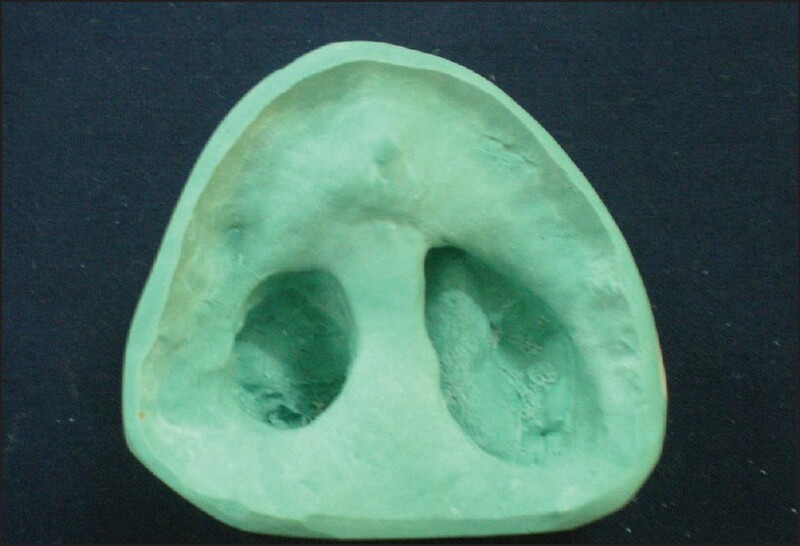 Record bases were made with heat cure acrylic resin (Lucitone 199, Dentsply Int.) [Figure 5].The jaw relation was recorded. 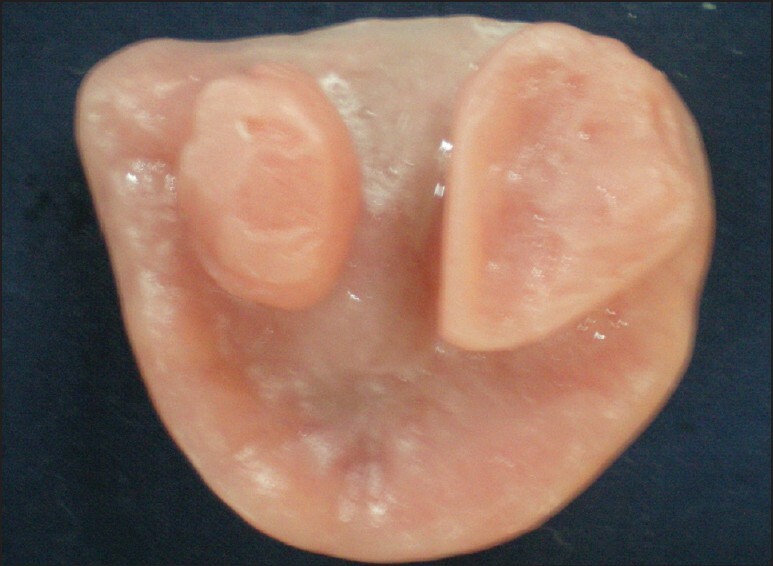 After the try-in, the solid obturator was processed in heat polymerized acrylic resin (Lucitone 199, Dentsply Int.). After curing of the prosthesis, the flash was trimmed. The prosthesis was pumiced, polished, and delivered to the patient [Figure 6], [Figure 7] and [Figure 8]. The patient was instructed to correctly position, remove, and clean the prosthesis. The prosthetic retention and stability were evaluated subjectively. Speech intelligibility improved and the patient was then referred to the speech pathology department for further evaluation of his speech and swallowing abilities. The patient returned a week later for a follow-up appointment. He was satisfied with esthetics and function of the prosthesis. An appropriate prosthetic fit and functional success ensure that the patient ultimately uses the device during daily routines. It is important that clinicians do not overlook the importance of referral to the speech pathologist, particularly in patients for whom the success of a prosthetic obturator after total or sub-totalmaxillectomy depends on the ability to adequately speak and swallow. Subtotal and total bilateral maxillectomydefects represent a complex challenge for the maxillofacial prosthodontist. 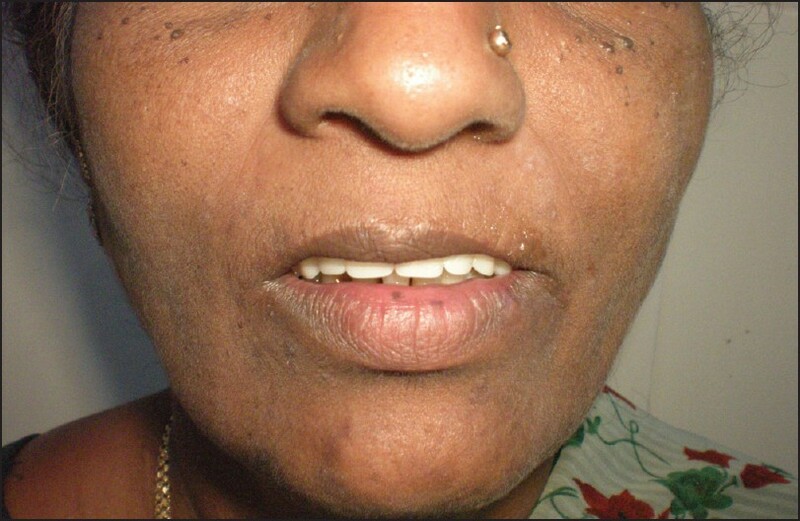 In this clinical report, preoperative treatment planning involving the head and neck surgeon, the maxillofacial prosthodontist, and the speech pathologist resulted in a obturator that enabled the patient to speak and swallow successfully. 2. Jacob FJ. Clinical management of the edentulous maxillectomy patient. In: TD Taylor, editor. Clinical maxillofacial prosthetics. Chicago: Quintessence; 2000. p. 85-7. 3. Beumer J, Curtis D, Firtell D. Restoration of acquired hard palate defects: Etiology, disability and rehabilitation. In: Beumer J 3 rd , Curtis TA, Marunick MT, editors, Maxillofacial rehabilitation: prosthodontic and surgical considerations. St. Louis: Medico Dental Media Intl; 1996. p. 225-84. 4. Mahdy AB. Processing a hollow obturator. J Prosthet Dent 1969;22:682-6. 5. Chalian VA, Barnett MB.A new technique for constructing a one-piece hollow obturator. J Prosthet Dent 1972;28:448-51. 6. Matalon V, La Fuente H. A simplified method for making a hollow obturator. J Prosthet Dent 1976;36:580-2. 7. Tanaka Y, Gold HO, Pruzansky S. A simplified technique for fabricating a light weight obturator. J Prosthet Dent 1977;38:639-42. 8. Parel SM, La Fuente H. Single-visit hollow obturators for edentulous patients. J Prosthet Dent 1978;40:426-9. 9. Schneider A. Method of fabricating a hollow obturator. J Prosthet Dent 1978;40:351. 10. Guelde DJ. Pre-fabricated hollow bulb obturator technique. Quintessence Dent Tech 1980;6:65. 11. Holt RA Jr.A hollow complete lower denture. J Prosthet Dent 1981;45:452-4. 12. Worley JL, Kniejski ME. A method for controlling the thickness of hollow obturator prosthesis. J Prosthet Dent 1983;50:227-9. 13. Elliott DJ. The hollow bulb obturator: Its fabrication using one dental flask. Quintessence Dent Tech 1983;7:13-4. 14. Knapp JG. A simplified approach to the fabrication of a maxillary obturator prosthesis. J Prosthet Dent 1984;51:67-9. 15. Browning JD, Kinderknecht J. Fabrication of a hollow obturator with fluid resin. J Prosthet Dent 1984;52:891-5. 16. Radcliffe GJ, Mady S, Burr R, Cheesman AD, Wilson D. A new immediate temporary light weight obturator for maxillectomy cavities. Br J Oral Maxillofac Surg 1984;22:50-3. 17. Minsley GE, Nelson Dr, Rothenberger SL. An alternative method for fabrication of a closed hollow obturator. J Prosthet Dent 1986;55:485-90.